Being raised in and around the Midwest farm life, eating great food is a favorite past time. I remember days of homemade rhubarb and apple pie with the ice cream we made in the old machine that my brother and I had to take turns cranking. The multilevel marketing company of Tastefully Simple started in a similar fashion. It was hatched in the Midwestern community of Alexandria, Minnesota. Jill Strahan had been a gift basket designer and seller for many years from a small shed at her home. One year, Jill decided to add a sampling of delicious recipes, and they went over quite well. She sold more of the recipe items than she did baskets, so Jill attempted the same move again the next year with the same results. So, Jill started Tastefully Simple in 1995. In a decision to use the multilevel marketing business format, Jill met with her first 9 consultants in 1996 in St Cloud, Minnesota. Ever since that point, Tastefully Simple has climbed like a rocket. Tastefully Simple and CEO Jill Blashack Strahan have won many awards, and have been featured in numerous publications and media. In today’s post, I am using a variety of sources to determine the top 20 products from Tastefully Simple. I am looking at sales figures, online reviews and personal and family opinions. I will start at #20 and work my way to the #1 Tastefully Simple product. Keep in mind that I am not affiliated in any way with Tastefully Simple. I have tried various products this company sells, but I am not aware of any of my friends or family who are independent consultants. At the end of this post, feel free to share your favorite Tastefully Simple products. For all the chocolate lovers, this mix is delectable. There are chunks of chocolate in the midst of this dark brownies. All you need to add is 1/2 stick of butter and 2 large eggs, and you can serve 16. Whoever came up with the idea of combining caramel corn with cinnamon rolls should be awarded the Food Nobel Prize. This box of caramel/cinnamon roll corn is addictive. If you are wise, you will make sure you have 2 or 3 boxes on hand, because when you start, it is nearly impossible to stop unless the box is empty. I will say this is a bad choice if you are on a diet. The great reviews just keep rolling in for this seasoning mix. People love it on chicken and also potatoes. The blend is garlic, black pepper, rosemary and thyme. It works great on almost anything, except probably ice cream. This oil has a slight nutty taste with the avocado flavor. It is a great sauteing oil and can also be mixed with vinegar for a wonderful salad or sandwich dressing. Living here in Puerto Rico, I know how great Avocado oil can be. By just adding 1 cup of water and 1/2 stick of butter, you will find these to be some of the most delightful muffins you have ever tasted. I could eat these all day, but the calories wouldn’t be a great delight when I jumped on the scale. Tastefully Simple makes the best Mudslide mix. The chocolate and coffee is blended well, and all you have to do is add the milk and the vodka. It is a wonderful treat, and it tastes great without the alcohol too if you so desire. This is a perfect blend of onion, sea salt, shallots and chives that give that wonderful onion flavor to your recipes. This is a huge selling product from Tastefully Simple. It may sound like an odd mixture, but this super chocolate has a load of butter, and just that perfect amount of sea salt to make a great sauce that goes well on nearly anything. Ohhh, the love of chocolate! The wine, mushrooms and spices in this fantastic sauce can turn a roast into a work of art. You will dazzle your friends and family when you serve the meal. Be careful, they may show up for all your meals. 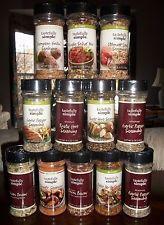 Make an award winning chili with this fantastic seasoning from Tastefully Simple. It has the perfect blend of chili pepper, onion and garlic to add a flavor that will make your chili the favorite on your block. This seasoning gives your dishes that South of the Border excitement. It is a great seasoning to add to your ground beef or chicken when you are making tacos or burritos, and others add it to sour cream and guacamole for a wonderful dip to use with tortilla chips. We all love bacon, don’t we? This smoked bacon flavor with a dabble of onion flavor can spice up almost any recipe. You can add it to main dishes, salads or use it to make a great dip for vegetables or chips. This salsa is great to add to meats such as chicken or pork. Or, you can use it as a dip for chips. You could even make a tasty soup with this wonderful mix. This mix is a huge seller. It has a perfect blend of cinnamon. All that needs to be added is 2 cups of chopped apples, 2 large eggs and if you desire, you can add 1 cup of chopped walnuts. It is just like Grandma used to make. I just love caramel apples, and this is a perfect sauce to use in making them. You can also use it as a topping for ice cream, and something I always loved, use it as a dip for celery or carrots. Caramel seems to go great with anything. This will be a crowd favorite when you serve it with chips or vegetables. All you have to add is 8 ounces of soft cream cheese and 1 cup of shredded Swiss cheese. This also is a great sauce for pasta or cook it with your chicken in the crock pot. Reviews on this Tastefully Simple product all give this dip 20 out of 10 stars. This cake mix is a huge favorite of many. The almond flavor gives so much meaning to this pound cake that you can eat it plain, with your favorite ice cream or with fresh fruit. Just add 1 1/2 sticks of butter and 1 cup water, and you will have a great almond pound cake. I must admit, this is my favorite. I use this as an additive to chili. Others use it to coat their grilled chicken or pork. It also is a great topping for shrimp. The sweet and hot go together quite well. This is a huge favorite! 1 teaspoon of Garlic Garlic seasoning is equal to 1 clove of garlic. Add it to your dishes that require garlic, or use it to make garlic bread. No more peeling fresh garlic, just use a dash of Garlic Garlic. There is no question to it… this is an absolute for being number 1. It is probably the biggest seller and the reviews are raving about this beer bread. As it cooks, you will have neighbors ringing your doorbell asking for some fresh bread. All you need to add is 12 ounces of a carbonated beverage, with beer being the primary choice. It is also optional to add 3 tablespoons of melted butter. Many people claim it is the best fresh bread they have ever tasted. Well there is my opinion of the top 20 Tastefully Simple products. Are you in agreement, or do you have a different opinion? What are your favorite Tastefully Simple products? This seems to be a great opportunity for those who love food, recipes and cooking. You can have the Tastefully Simple products you love and also make it a home based business selling the products and creating a team of others who like the products. If you think Tastefully Simple would be the kind of MLM business you may like, or if you just want to try some of their products, I suggest you visit their website which is in the reference section below. Please leave your comments or questions in the comment are at the end of this post. By the way, I think I gained 20 pounds writing this post. Disclaimer: Neither I nor the Online MLM Company is affiliated in any way or form with Tastefully Simple. This is not a paid review. It is written strictly for your information.